Jean-Marc Conrad, president of Nîmes Olympique, and suspected of being implicated in match-fixing for the southern French Division 2 club towards of the end of last season, has resigned his position, according to a communiqué by his lawyer Michael Corbier. Mr Conrad, who was arrested yesterday as part of a police enquiry into the affair, was released on bail afterwards and on condition that he would not exercise any of his professional functions pending the results of the enquiry – similarly to his colleague at Stade Malherbed de Caen Jean-François Fortin. Authorities leading the enquiry suspect the two football club presidents of having organised between them to fix the result of a match between their teams on the 13th of May last. In order to win promotion to Ligue 1, the Norman side were hoping for a draw. It was the same requirement for the southerners – Nîmes – who required a draw in order to avoid getting relegated to the third division. 50-year-old Conrad had arrived at the head of the Gard club in April last, along with three other shareholders, including the mysterious and flamboyant brasserie owner Serge Kasparian – a man who had previously been questioned over his association with conspiracy to launder money in an organised grouping in the infamous Cadet gambling club in Paris. It was while listening in on telephone conversations during the course of investigating this latter affair, that authorities were alerted to the possibility that illicit match-fixing may have been going on. 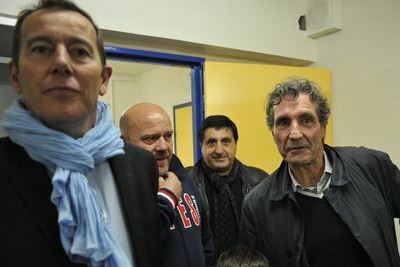 A former auctioneer and founder of the property press group Immoxia, Jean-Marc Conrad had previously held a position as club president for 2nd-division side Arles-Avignon from 2008 to 2010. If found guilty of the charges currently being levelled against him, he may end up with 5 years in prison and up to €1,000,000 in fines. Six people were questioned on Thursday on charges of corruption. Apart from Mr Conrad, Mr Kasparian and Mr Fortin, the three other protagonists in the drama are businessman Michel Moulin, president of amateur side AS Ararat Franck Toutoundjian and Kaddour Mokeddel – head of security at Caen football club, who was also banned from his professional role pending the results of the police enquiry. Previous Previous post: Beaujolais Nouveau Resurgence!